In a resource-driven world, where emerging non-state actors are exerting real influence over international affairs, the politics surrounding Antarctica, the largest land area of disputed sovereignty, which has witnessed no violent conflict between states, eludes simple explanation. This case study first briefly summarizes the history of sovereign claims to the region and the international treaty system that provides governance. Then it evaluates the nature of the physical environment, including the effects of climate change and resource extraction, in the context of state interests to assess the potential for conflict. For the purposes of this limited study, potential conflict is theorized from an interest in resources and power, broadly construed, in the international system. It is argued here that while conflict appears unlikely, contentious, politically sensitive and media-driven issues, such as whaling, bring a confluence of actors and interests to the scene. Non-governmental organizations (NGOs, such as Greenpeace) are but one example of such actors. If not mitigated properly, or if the process of mediation is not institutionalized effectively, potential for violent conflict may arise. In cases of accidents or isolated incidents of belligerence, notions of responsibility may increase tension between states. While Antarctica was first circumnavigated in 1773, the climate, for many states, appeared inhospitable. It was not until the end of the 19th century that the land itself began to be explored, and shortly after, in 1908, the first public claim to the territory was established (Great Britain). The rationale was not only scientific research, but also the development of the whaling industry. This resulted in countering diplomatic claims and debates (see Taubenfeld 1961; Peterson 1987). Indeed, Norway's 1939 claim to Antarctica territory was carried out with this in mind (Auburn 1982: 3). Thus, the exploration of Antarctica was, at least partially, motivated by resource extraction and can be generally explained by balance-of-power politics. After World War II, the creation of the United Nations, the era of international institutions, and the rapidly developing global economy saw increased interaction, which brought conflicting state interests to the forefront. "It was in the coldest of all the continents that there was the first memorable thaw in the cold war." Since 1945, there have been several diplomatic texts and international legal agreements that appear to constrain the behavior of states. Antarctica is a peculiar case in international relations because tensions clearly existed as the two major superpowers after World War II, the US and the USSR, both began to show interest in the territory. However, after years of discussion on how to manage Antarctica, which was influenced by the scientific community, 12 states (Argentina, Australia, Belgium, Chile, France, Japan, New Zealand, Norway, South Africa, the USSR, the UK, and the US) drafted and signed the 1959 Antarctica Treaty, which entered force in 1961. The preamble states that "Antarctica shall continue forever to be used exclusively for peaceful purposes and shall not become the scene or object of international discord." Indeed, perhaps because of Antarctica's uniquely harsh climate and the small community of Antarctic scientists who constantly oversee scientific activity, the conditions allow for relatively simple monitoring of this Protocol (though further research, perhaps interviews of Antarctic scientists, may provide robust support for this claim). Beck (2003) also notes that Treaty Parties conduct inspections as well and, in 2001, a secretariat for the Treaty system was established in Buenos Aires. Whether the continuing peaceful influence of international law is an extended institutionalization, or construction, of shared knowledge about appropriate diplomatic approaches to conflict or is simply a weak practice bound to be broken when the benefits outweigh the costs, remains an open question. Relevant links to the legal documents can be found at either the Antarctic Treaty Secretariat, the British Antarctic Survey or the US State Department's Handbook of the Antarctic Treaty System. Scott Barrett has written extensively on environmental diplomacy and international environmental regimes. His perspective is that the Antarctica treaty system is rife with unresolved legal inconsistencies, which without consensual clarification, may lead to conflict in the future. Indeed, he is pessimist about the chances for continued peace in Antarctica (Barrett 2003: xiv, 118 and 158). He argues that the Protocol's mineral ban can be explained through a cost-benefit analysis, that exploitation of the continent is currently not profitable. For Barrett, the meaningful test of the Antarctic regime is the time when technologies and prices of exploitation become reasonable. Other scholars deem the system a model for international cooperation. While noting the possibility for conflict because of resources, Peterson’s research shows that Antarctica was not on the agenda for the UN General Assembly from 1959 to 1983. For him this is evidence of persistant cooperation and shows a distinct lack of conflict (Peterson 1988: 1). For Peterson, pure power politics may not fully explain the case of Antarctica (Peterson 1988: 24). However, it may still be counter-argued that the technology to make Antarctic resource extraction profitable is due to arrive soon, giving the analysis here relevance to contemporary politics. The chart below details some dates to consider when thinking about the case of Antarctica in the international system. The surface area of continent is slightly larger than Europe (more than 14 million square kilometers). This image is taken from the CIA's World Factbook online. As mentioned above, to mitigate violent conflict, 12 countries drafted and signed the 1959 Antarctica Treaty. Of these, seven claimed sovereign rights to areas of the continent: Australia, France, New Zealand, Norway, Argentina, Chile, and the United Kingdom (the territorial claims of the last three overlap). The US, Russia and South Africa still do not recognize these claims, and this non-recognition is reciprocated by the seven claimants. There is also territory (about 15% of the continent) that remains unclaimed. It is important to contextualize this issue before advancing the argument. The notion of the state as the dominant political organizing entity can be articulated through the decline of suzerain entities (such as the Catholic Church) and the rise of colonial, global economies, substantiated by the development of the standing army and the conduct of war. Deeply embedded in this premise is the idea of physical area connected to the state. The physical land legally demarcated where lords and kings could violently express their power. Colonial borders signified who was being exploited and for whom. The resources of the land represented money for mercantilist monarchies. Arguably, land became a currency (commodification of land can be found in Polanyi 1944). Given the notion of territory, and its privileged treatment in a land-based state system, why does a slice of Antarctica remain unclaimed? The answer offered by Taubenfeld and supported by Peterson can be summed up as: 'just in case'. As Taubenfeld writes, the "United States is accorded tacit priority by the other claimants," (Taubenfeld 1961:249). Peterson expands on this, saying that because previous practice called for division of land with contesting claims, and that the unclaimed land could then accommodate the US once it recognized the others' claims. Peterson argues that the cost of entering into the regime means that the US could only receive their slice of the pie, rather than the whole continent. For Peterson, this rational-choice explanation is strong enough to explain why the US continues to not claim this land. Still this legal anomaly requires further study. Several non-state actors are important to note. They include environmental NGOs, science institutes, and eco-tourism or energy corporations. In short, with the WAIS melting rapidly, migratory species, such as birds, are forced to adapt to the enviro-temporal changes. Barbraud and Weimerkirch warn that: “these species may be unable to respond appropriately to changes occurring in their breeding area and therefore may be disproportionately negatively affected by current climate changes.” (Barbraud and Weimerkirch 2006: 6249-50) The effect of such biodiversity loss may be great given the fragile nature of the ecosystem. However, amendments may be made through consensus. Interestingly, the unratified Convention on the Regulation of Antarctic Mineral Resource Activities more specifically defines 'mineral resources' as "all non-living natural non-renewable resources, including fossil fuels, metallic and non-metallic minerals," and the Protocol does not bear this specification. However, as a practiced institution, this agreement appears stable and confines exploration of the island to scientists. It is notable that evidence exists to support the claim that signficiant mineral and fossil fuel (natural gas and petroleum) deposits may be present in Antarctica (Triggs ed. 1987: 165 and 176). The potential for the presence of minerals such as cobalt, chromium, nickel, uranium, copper and magnetite are based on similar geological formations in other parts of the world. There remain significant costs and risks to exploration, much less extraction, in the region (Triggs ed. 1987: 180 and 208-210). Harm sites may be on-shore and off-shore, in the case of drilling platforms. From this finding, which could be supported by further investigation and research, UNU-IAS warns that regulating such activity is needed so that biodiversity in the fragile ecosystem is maintained. While the study notes that bioprospecting in Antarctica remains limited, the intellectual property and patent issues involved in developing new pharmaceuticals based on Antarctic organisms could become massive. This second warning is relevant to conflict as it affects market development, international trade, and global health. The Convention for the Conservation of Antarctic Marine Living Resources entered force in 1982. The impetus for the Convention was to protect krill, as an essential low-level link in the delicate food chain of the region. Within three years, the catch of krill was cut in half (Triggs ed. 1987: 115) from 0.5 million tons to 0.25 million tons. This is a positive trend in stabilizing and managing an Antarctic resource. 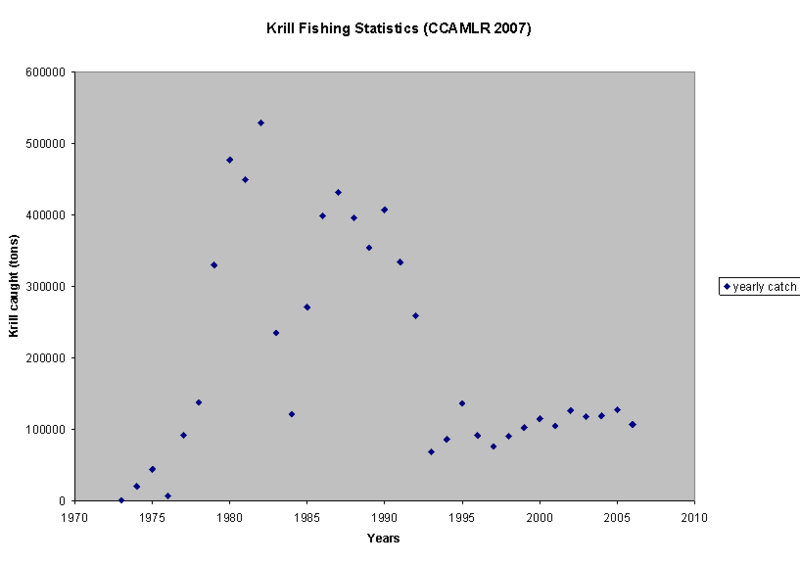 However, Nichol and Endo (1999) argue that revitalizing the krill fishery continues to be a distinct possibility. Indeed, tension between states may rise, at least diplomatically, due to the exposure created by media outlets and non-state actors in tracking state behavior. Unfortunately, this argument has not been proven to be accurate so far. 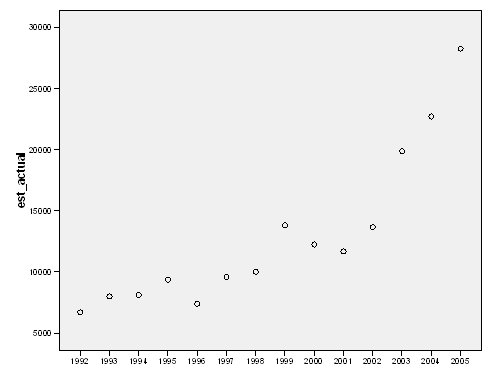 The scatterplot below describes the increasing trend of tourist activity in Antarctica. The figure from 2005 is double the number from 2002. It may be important to monitor and regulate such tourism because its impact could be worrisome if this trend continues (see also Child 1994: 137). Indeed, the source of the scatterplot is a relatively new industry group that recognizes the impact eco-tourism may have on the environment and is interested in promoting high standards and best practices. Relevant aspects of eco-tourism include the nature of the environmental footprint made by the large ships and their footprint. An analysis into this emerging sector and its corporate elements may be worthy to fully understand the impact of eco-tourism on the Antarctic Environment. The Antarctic Treaty regime, which includes accompanying Antarctic protocols and conventions, continues to guide state practice and perpetuate the diplomatic stalemate over sovereign rights. Many states continue scientific operations and some examples of cooperation can be found. Rescue missions, for example, often see military personnel cooperate and equipment shared (see "Chilean troops die in Antarctica," 30 September 2005: http://news.bbc.co.uk/2/hi/americas/4297550.stm). Because so few military personnel are actually on the continent, if conflict were to break out, major military action would likely occur in the air or at sea, rather than land. In such a scenario, states would likely need to bring in greater military force to project their power over another state. The small number of civilian-scientists could quite easily be removed to limit civilian casualties. However, one may also envision scientists taking the form of human shields to force militaries to think twice about their aggression. Regardless, military action, particularly prolonged action, in the region would serve to dangerously affect an already fragile ecosystem. No indigenous populations exist in Antarctica. The conflict would be an interstate war. However, extra-state war is a possibility. The ‘Question of Antarctica’ in the United Nations (UN) has been on-going since 1983. Beck (2004) reviews the numerous resolutions that have been passed by the UN General Assembly. 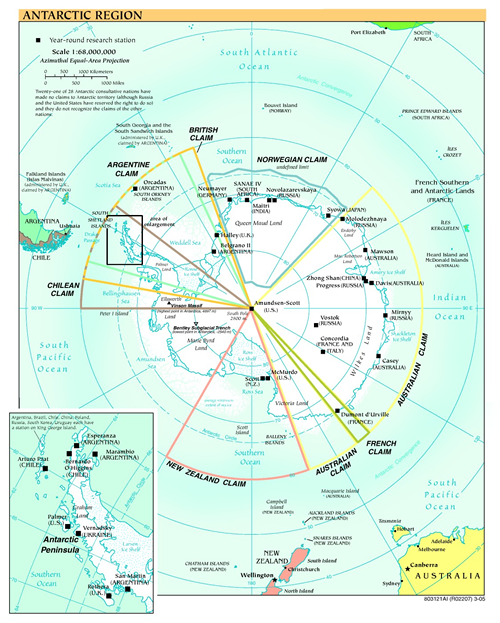 These moves, initially led by the Malaysian government in the 1980s, whose involvement has "often been interpreted as a personal preoccupation of [Prime Minister] Mahathir" (Beck 2004: 209), drew attention to the Antarctica Treaty System and the exclusive nature of its members to managing the continent. As a result, diplomatic disagreements became more visible, increasingly discussed, and more politically sensitive. The topic remains on the UN agenda, to be visited every three years. As Barrett argues, the clear and efficient means of exploiting Antarctic resources may keep disagreements at a low level. Still, so long as the question remains open and consistently appears on the UN agenda, political space for involvement may arise. Heller (2006) describes the ramming of Greenpeace’s small ship Arctic Sunrise by the Japanese freighter Oriental Bluebird (to be confirmed). The explanation for the ramming was panic when the Farley Mowat of the Sea Shepherd Conservation Society arrived on the scene. This ship and her crew, unlike Greenpeace’s ships, are purposely there to intervene, to disable whaling ships. The Japanese whaling ships harpooning and killing whales in the Antarctic region are presented as performing research by the Japanese government. NGOs such as the Sea Shepherd Conservation Society view such an interpretation as deceptive because the whales are not killed humanely, the research can likely be done without the killing, and the meat is sold at market prices for the government. While not necessarily violent conflict, such accidental rammings jeopardize the lives of the crews of NGO ships. Furthermore, they question who is responsible for safeguarding those waters; implicitly articulated who has sovereign rights to those waters and managing its resources. Even the preparation for war in such a turbulent climate can bring about fatalities. The threat of conflict exists and with it the possibility of fatalities, direct and indirect. Indeed, several states (at least the US and Russia) have soldiers trained in similar climates. Because conflict has not broken out, there are no military fatalities. However, accidents during scientific expeditions, transportation, or whaling excursions do occur (see 10). A more penetrating study of the Antarctic Treaty system entails historical and geographic analysis of the continent itself, the interested states, negotiators, international organizations, emerging markets and civil society. Rigorous evaluation of the forty years of the system's existence would take into account disputes and their resolutions over that time period, plus a review of the geopolitical characteristics of the continent. 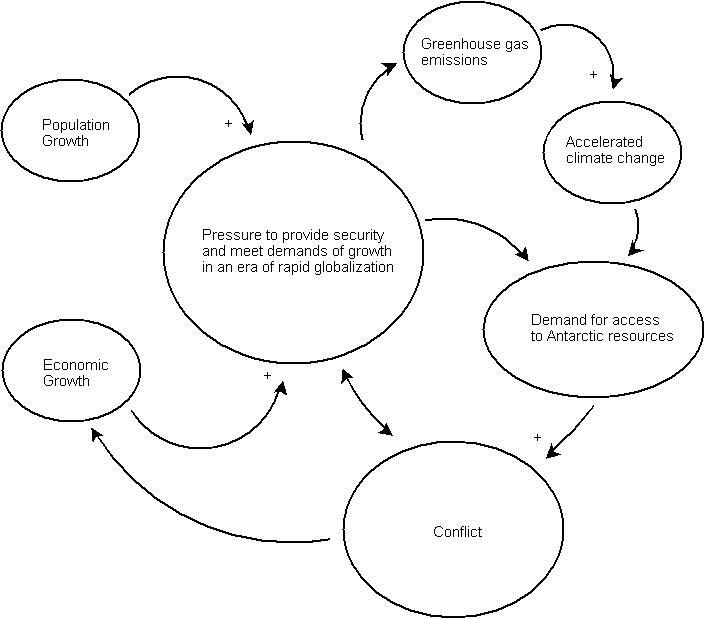 Based on the history of the system, institutions and common practices repeated and developed, the resource value of Antarctica, and perceptions of resources, conflict, and interests, an argument may be formed to explain why the system has developed the way it has, and how it may develop in the future. Importantly, trends on resource management, consumption, and conservation should be taken into consideration to identify how and when these factors become real in analyzing state action. To the question of colonization, perhaps made possible by the long-terms effects of global warming, only a speculative answer can be offered. As with many resources deemed necessary to acquire by the leadership and/or population of a state, conflict may arise. In the case of the European monarchies at the beginning of the 16th century, the potential to exploit the Americas through colonization brought about steady periods of war. This outcome is not pre-determined with the case of Antarctica. While the track record of diplomacy to mitigate conflict has been uneven, and in need of further exploration and better models for assessment, its mechanisms may be the key to building cooperative inter-state activity and mediation. Methodologically, further research on the Antarctic negotiations, NGO involvement, and wider news review (to include, for example, Financial Times or New York Times) would add to the anlaysis. The hypothetical model above operates on the level of a single state, assuming that the system of states remains relatively stable and that providing an acceptable level of security for a population is a critical ingredient to legitimacy in world politics (for example, see Tilly 1985). It also assumes that states sustain population growth and, at least pursue economic growth. These variables hypothetically cause, and positively correlate with, an increase in the pressure a state feels to secure economic growth and meet the lifestyle demands of the population. This pressure could cause the state to pursue access to Antarctic resources, increasing the potential for conflict with other states. Framed as such, interest calculation would include the following variables and their values: eco-tourism market value, whaling industry market value, mineral resource value, and bioprospecting market value, related to the cost of acquiring and/or dominating these markets. Indeed, these may shift depending on the climate. While the continent remains contested as a matter of international law, the history of conflict mitigation, current ban on resource exploration until 2048, and state of polar resource extraction technology are significant considerations and serve to constrain state behavior. There one case directly related to Antarctica. Its relevance is obvious. To determine relevance of other cases, issues were identified that are potential sources of conflict for the Antarctica case study. They are: overfishing and whaling in the region and biodiversity loss (as a resource for medical research, among other industrial sectors). In short, relevance is defined as cases that deal directly with Antarctica or whose central issue deals with either overfishing or biodiversity loss. Related cases (3 searches were conducted: field=sea species loss, field=general habitat loss, keyword=Antarctic). They are categorized by their relationship: geographic proximity, fishing resources, biodiversity loss, and resource management of protected land. Canada and Spain Fish Conflict (ICE 62/67): Dispute regarding access to fish stock. Naval action ensued, shots fired, including boarding of a fishing vessel. Over Fishing and the Use of Satellites in Monitoring and Protecting the Fish (ICE 107): To regulate the global fishing sector, the FAO, in essence, has creating a compliance mechanism through the use of satellites. The goal is to reduce fish piracy and manage fish stocks – the EU being the case study for such management. Interesting case for examining delegation to a supranational body for resource management. Cod Dispute Between Iceland and the UK (ICE 7): Dispute regarding access to fish stock. Shots fired in naval action. Dispute Over Barents Sea (ICE 121): Dispute regarding access to fish stock. Includes dispute over mineral rights, water boundaries. Bio-Bio River Case (ICE 51): Dam construction disrupts water flow, which in turn, affects habitat for animals and other species. Cortes and Aztec Gold, Initial Conflict and Modern Political Ecology (ICE 174): Argues that biodiversity is a resource as ethnobotanists extract rare species for use by a variety of sectors: food, agroforestry, pharmaceutical, agrochemical, commercial seed, biotechnology, veterinary medicine, and cosmetics. Plan Pacifico in the Chocó Region of Colombia (TED 494): Resource extraction (timber/gold) is leading to environmental degradation, in terms of habitat loss, leading to biodiversity loss. Mining in Argentina and the Environment (TED 410): Chubut (Patagonia) area being mined, causing environmental degradation – defined as habitat loss. While Argentina may be party to international environmental conventions, there is no mention of national legislation protecting this land. US-Canada Border Dispute (ICE 36): The border between the US and Canada has gone through a series of contentious moments in history, Alaska being the focus of several. Interesting is the case of the Waterton-Glacier International Peace Park. Treaty stipulations from 1925 require a marked border between the US and Canada. In this case, the park straddles the border and creating a visible border here would require clear-cutting. It’s not clear that the clear-cutting was stopped. However, a transnational board (which rejected the protests of environmentalists, apparently) does manage the park. These cases clearly match the multilateral, resource-driven, threatening nature of the Antarctic situation and may provide insight into how and why the international community became involved and took whatever actions it did. They, by and large, are not in my first related cases set as my searches focused on the environmental issue and geographic proximity instead. Alley, R. B., Marotzke, J., Nordhaus, W. D., Overpeck, J. T., Peteet, D. M., Pielke Jr., R. A., Pierrehumbert, R. T., Rhines, P. B., Stocker, T. F., Talley, L. D., Wallace, J. M., "Abrupt Climate Change," Science 299: 5615. Auburn, F.M. (1982) Antarctic Law and Politics. Bloomington: Indiana University Press. Barbraud, Christophe and Henri Weimerskirch (2006) “Antarctic birds breed later in response to climate change,” Proceedings of the National Academy of Sciences 103: 6248-6251. Barrett, Scott (2003) Environment and Statecraft. Oxford: Oxford University Press. Beck, Peter J. (2002) “The United Nations and Antarctica, 2002: ‘constructive engagement’ between the Antarctic Treaty System and the United Nations,” Polar Record 39: 231-238. _____ (2003) “Twenty years on: the UN and the `Question of Antarctica,' 1983-2003,” Polar Record 40: 205-212. _____ (2006) “The United Nations and Antarctica, 2005: the end of the ‘Question of Antarctica’?” Polar Record 42: 217-227. Boczek, Boleslaw A (1984) “The Soviet Union And The Antarctic Regime,” American Journal of International Law 78: 834-858. Child, Jack (1994) "The Politics and Ecology of Tourism in the South American Quadrant of Antarctica," MACLAS Latin American Essays 8, 121-139. Cohen, Harlan K. (ed.) (2002) Handbook of the Antarctic Treaty System, 9th ed. Washington, DC: US Department of State. Accessed at: http://www.state.gov/g/oes/rls/rpts/ant/. Croxall, J.P., P.N. Trathan, and E.J.M urphy (2002) “Environmental Change and Antarctic Seabird Populations,” Science 297: 1510-1515. Homer-Dixon, Thomas F. (1991) “On the Threshold: Environmental Changes as Causes of Acute Conflict,” International Security 16: 76-116. Intergovernmental Panel on Climate Change. 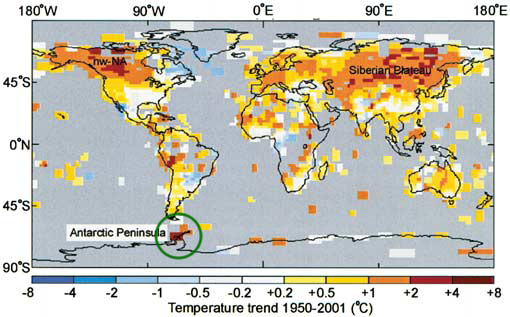 (1997) The Regional Impacts of Climate Change. Intergovernmental Panel on Climate Change. (2001) Climate Change 2001. Intergovernmental Panel on Climate Change. (2007) Climate Change 2007. Mossop, Joanna (2005) “When Is A Whale Sanctuary Not A Whale Sanctuary? Japanese Whaling In Australian Antarctic Maritime Zones,” Victoria University of Wellington Law Review 36(4): 757-774. Accessed at: http://www.austlii.edu.au/nz/journals/VUWLRev/2005/34.html. Nichol, Stephen and Yoshinari Endo (1999) "Krill fisheries: Development, management and ecosystem implications," Aquatic Living Resources 12(2): 105-120. Nichol, Stephen and Jacqueline Foster (2003) "Recent trends in the fishery for Antarctic Krill," Aquatic Living Resources 16: 42-45. Oppenheimer, M. and R.B. Alley (2004) “The West Antarctic Ice Sheet and Long Term Climate Policy,” Climatic Change 64: 1-10. Peterson, M.J. (1998) Managing the Frozen South. Berkeley: University of California Press. Quayle, Wendy C., Lloyd S. Peck, Helen Peat, J.C. Ellis-Evans, and Richard P. Harrigan (2002) “Extreme Responses to Climate Change in Antarctic Lakes,” Science 295: 645. Shapley, Deborah (1985) The Seventh Continent: Antarctica in a Resource Age. Washington, DC: Resources for the Future. Taubenfeld, Howard (1961) "A Treaty for Antarctica," International Reconciliation 531: 245-322. Rueschemeyer, and Theda Skocpol (eds.) Cambridge: Cambridge University Press. Toma, Peter A. (1956) “Soviet Attitude Towards the Acquisition of Territorial Sovereignty in the Antarctic,” American Journal of International Law 50: 611-626. Triggs, Gillian D. (ed.) (1987) The Antarctic Treaty regime. Cambridge: Cambridge University Press. UNU-IAS (Dagmar Lohan and Sam Johnston) (2005) Bioprospecting in Antarctica. Accessed at: www.ias.unu.edu/binaries2/antarctic_bioprospecting.pdf. Vaughan, David G., Gareth J. Marshall, William M. Connolley, Claire Parkinson, Robert Mulvaney, Dominic A. Hodgson, John C. King, Carol J. Pudsey and John Turner (2003) “Recent Rapid Regional Climate Warming on the Antarctic Peninsula,” Climatic Change 60: 243-274. Walther, Gian-Reto, Eric Post, Peter Convey, Annette Menzel, Camille Parmesank, Trevor J. C. Beebee, Jean-Marc Fromentin, Ove Hoegh-Guldberg, and Franz Bairlein (2002) “Ecological responses to recent climate change,” Nature 416: 389-395.